In this piece from Mountaineer magazine we explore the history of Freedom of the Hills, and what additions the 9th edition brings to this classic mountaineering title. In 1934, a group of aspiring Seattle peak baggers lined the railings of the Rialto Building to watch a young University of Washington student named Wolf Bauer rappel three stories down the central shaft. The maneuver was one of several climbing techniques Wolf had taught himself using materials solicited from family ties in Germany. 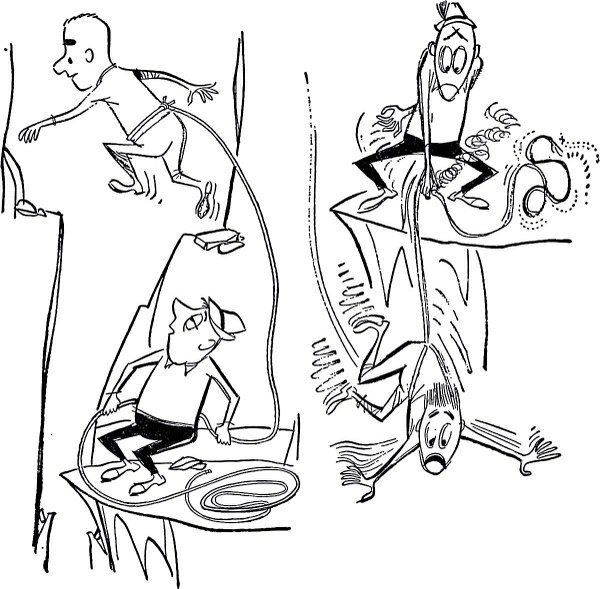 In lieu of a belay device or climbing harness, neither of which had been invented, Wolf ran two lines of rope between his legs, around one thigh, up and across his chest, over his shoulder, and down his back. Wolf admitted he was “scared as hell going down that thing,” but his feet met the marble floor softly, much to the admiration of his onlookers. The technique – called the dulfersitz rappel – would be one of many mastered by Wolf and his cohort in the years to come. 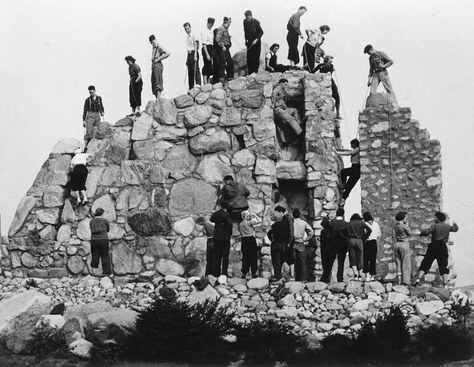 Together, they formed the first Mountaineers’ climbing course in 1935. Although The Mountaineers had existed as a club since 1906 with many impressive summits to its name, the climbing course represented a new breed looking to go lighter, faster, farther, and higher into the seemingly endless peaks surrounding Seattle. As it turned out, their careful study of ice ax arrests, piton placements, and hip belays wasn’t just revolutionizing The Mountaineers – it was setting the standard for mountaineering in North America and laying the foundation for a legacy that would span the globe. In 1939, the climbing course instructors compiled their lecture outlines, an exercise that led to the first book in the nation dedicated solely to climbing education. They called it the Climbers Notebook. 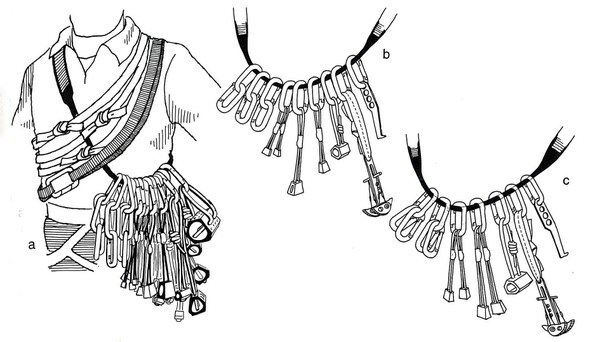 Its knots, gear recommendations, techniques, and timeless advice such as “be as discriminating in your choice of climbing companions as you are in selecting your outfit” had been battle tested on first ascents of Mount Goode, Mount Challenger, and Spire Point. And its teaching methods had been solidified through the climbing course, which had grown to a hundred students. Seattle’s Superior Publishing Company bought the rights and republished the book as the Mountaineers Handbook in 1948. By 1954, the book was nearly out of print, and advancements in climbing meant it was due for a major revision. Harvey Manning, a talented writer and passionate climber and club member, was tasked with the job. What followed was a 412-page comprehensive guide to alpine climbing called Mountaineering: The Freedom of the Hills published in 1960. The product of dozens of volunteers and countless hours of work, the book gained notoriety outside the club, blowing through the 5,000 copies originally printed. The success paved the way for The Mountaineers to publish other titles, eventually leading to the establishment of Mountaineers Books, the professional publishing house we know today. The ninth edition of Freedom, released in 2017, represents the latest in a series that has sold 720,000 copies and has been published in a dozen languages. Still written by Mountaineers volunteers, Freedom comprises the course material for people as far away as the Philippines Mountaineering Club, carries the moniker “the bible of mountaineering,” and is the book that everyone from Jim Whittaker to Rick Ridgeway to Kit DesLauriers credits as their gateway into the mountains. A beloved Seattle artist, weatherman, and Mountaineers member, Bob was behind the human figure illustrations, and his unique cartoon style became a signature of the earlier editions. In Freedom 5, The Mountaineers continued to use Bob, but moved to realistic illustrations in order to more precisely render techniques. The overhaul required staging hundreds of photos for Bob to work from. Marge Mueller, who served as the Art Director at Mountaineers Books, orchestrated the new illustrations for Freedom 5. She remembers a particular hollow core door she’d prop up at an incline for climbers to simulate techniques on. In the case of maneuvers like self-arrest, Marge laughed that the door lacked the sliding properties of snow, so models were forced to wriggle around on their stomachs and backs to stage each shot. Marge worked with Mountaineers volunteers to make sure each depiction was just right, a process that required trading hundreds of drafts back and forth, working with typesetters, and laying out paste boards by hand. Through persistence, the project moved from the hollow core door to the detailed renderings of Freedom 5 – illustrations that went on to be studied by climbers around the world. From edition to edition, the illustrations reveal an evolution in artistic style and a revolution in mountaineering technique and technology. Freedom 9 features all-new, vectored illustrations, allowing even more detail – an overhaul that, like Freedom 5, demanded copious amounts of time. That Freedom continues to be the go-to book on climbing is a testament to the ethos that inspired Wolf’s rappel and Marge’s tireless work. Behind each update are Mountaineers challenging themselves to study, refine, and share their craft. How do you belay without a harness or device? Carefully! Freedom 1 advises the belayer “torture himself with a mental picture of the fall and all its consequences to the climber, the belayer and the rope.” As seen in Freedom 4, the figures have harnesses (there’s information on commercial and homemade options), but hip belays are still the prominent technique (belay devices are presented as a viable method, but the models at the time made the process somewhat cumbersome). Freedom 9 includes revamped belay instructions aligned with the American Alpine Club’s nationwide universal belay standard. Freedom 6’s cast of character got a major makeover in Freedom 9. A meeting with Outdoor Research inspired Steve McClure, who authored the updates, to think of clothing in three dimensions: exertion, temperature, and precipitation. 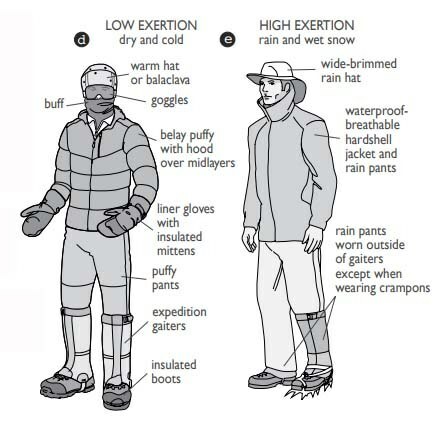 Things have come a long way since the Mountaineers Handbook, which contains detailed instructions for nailing boots and recommends a pull over parka due the propensity of zippers to break. In the 1970s, “clean climbing” transformed the techniques and equipment used on rock. Removable nuts, chocks, and springloaded cams replaced rock scarring pitons, allowing climbers to protect themselves with greater ease and reduce their environmental impact. By the time Freedom 5 was published, climbers carried a radically different arsenal than the hammers and pitons seen in Freedom 1. First aid kits are part of the now famous Ten Essentials, introduced by Harvey Manning in Freedom 3. 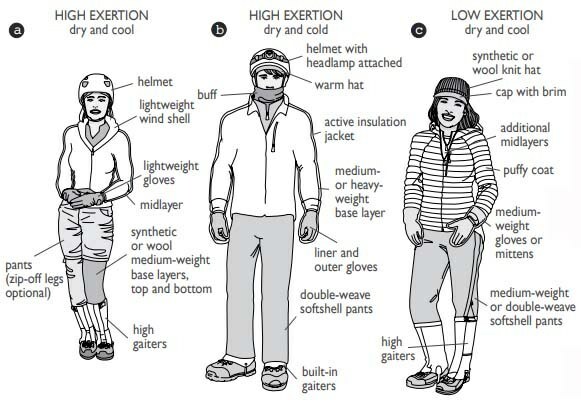 To this day, everyone from REI to the Appalachian Mountain Club uses the list as a baseline for what to pack. In Freedom 9, Steve McClure says, he ventured to update the “sacred scrolls that came down from Harvey Manning.” The revision included revamping navigation to expand on electronics like GPS and reorganizing items into two categories: addressing emergencies and preparing to safely spend the night.